I’ve sat at my computer for the last twenty minutes or so trying to decide how to start this review. I’m not just typing that to be modest, I really have no idea where to begin with this. I’m hoping that by just getting the fingers moving I can set in motion more typing that will result in a review for you dear readers to read. 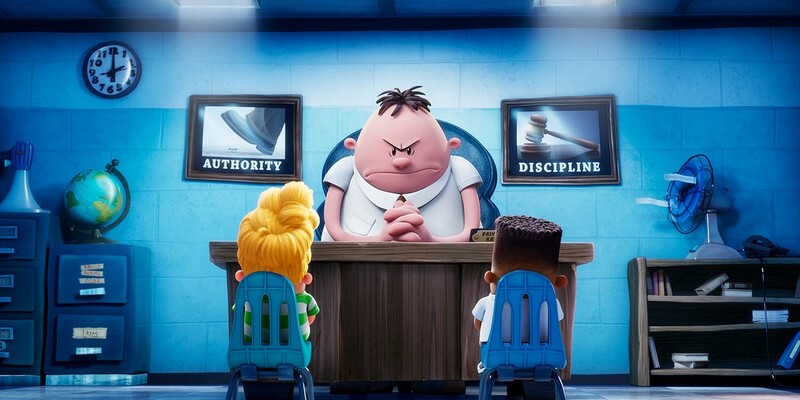 But…damn it, I’m talking about a movie called “Captain Underpants: The First Epic Movie,” and I have to try to explain that with a straight face. Well, alright, maybe not a straight face (it’s not like you can actually see me), but I at least have to write as if I’m taking this seriously. But how can I take when the movie doesn’t take itself seriously? Even our main heroes talk to the audience and pretty much brag that they like to pull pranks because they are bored and don’t take school seriously. And how many times can I write seriously in a review that is about as irreverent as they come? Never mind, let’s do this for real. I am at a partial advantage because (unlike most parents who are going to be dragged to this) I HAVE read a few of the adventures of ‘Captain Underpants’ in book form. The books are, shall we say…pretty juvenile. They don’t take themselves seriously and neither does the main target audience reading them. At the ripe age of six, it’s not difficult to get a laugh from the kiddies, and the books have done this for years by serving up a serving of poop and fart jokes. 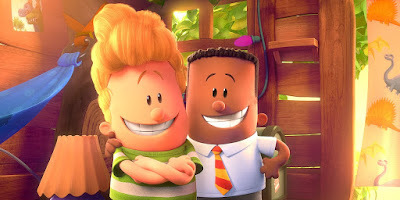 The movie brings this same style of humor to the table, but manages to bring the characters to life with fluid animation and a style that looks like a comic book just came to life. There are even scenes of 2D animation! Which, if there are any kids out there unfamiliar with the term, means people actually drew some of the movie. By hand! Yes, people used to actually do that! Pretty cool, huh kids?! Man…I am trying VERY hard to make this review read respectable right now! The story follows two best friends named George (Kevin Hart) and Harold (Thomas Middleditch) who spend their days drawing comic books, pulling pranks at school, and always squaring off with their nemesis Principle Benjamin Krupp (Ed Helms), who is bitter and doesn’t believe that fun should come at the cost of turning the education system into compete anarchy. Yet thanks to…you know what, no, I’m not even going to TRY and explain what happens next! You’re just going to have to discover this for yourself, but the boys manage to make it so that when they snap their fingers, Mr. Krupp believes he is Captain Underpants, and will do whatever they say. This may come in handy when an evil scientist who wants to drain the world of laughter joins the school. His main beef is…sorry, I don’t want to spoil that either. One of the reasons I’ve been having a hard time writing this review is because most of the humor is very clever and hilarious, and I would SERIOUSLY hate to deprive my readers of discovering some really funny stuff! The movie was made by DreamWorks Animation, who a few months ago released “The Boss Baby” into theaters (which, now that I think about it, is still hanging in there). That movie was better than I thought it would be, but it still felt a little restrained, and never really lived up to the absurdity of its premise. This is no problem with “Captain Underpants: The First Epic Movie,” which embraces the silly and the low brow, and does so with energy and a “Weird Al” Yankovic song to boot. Bottom line: The movie is pretty much a blast from beginning to end. Not important in the slightest, yet it has such great comedic timing it reminded me of the old Looney Tunes shorts, where characters move fast and engage in some of the best slapstick you’ve seen. The animators know to slow everything down once in awhile so that the audience doesn’t walk away exhausted, and the movie never overstayed its welcome. I think this is DreamWorks working at the top of their game when it comes to comedy, resulting in a movie that is stylish to watch, funny as hell, and non-offensive enough that you walk away feeling like your time hasn’t been wasted. Sure, the studio has released much better movies before, but once in awhile it’s great to just have a grand old time, and this is a LOT more fun (and kid appropriate) than “Pirates of the Caribbean: Dean Men Tell No Tales,” so you parents may as well just settle in for the ride. What I can’t figure out is why the material was so controversial in school. If the school system can’t see the humor in this, I think the movie has more than proved its point. Parents, there IS a fair amount of crude jokes (most involving bodily functions)! Some anti-social behavior is also presented as a good thing, so parents with impressionable kids might want to keep that in mind. Recommended for ages 7 and up.